The folding Checktemp®4 provides practical temperature measurement for the food service industry. Special attention was given to the ergonomic form of Checktemp®4. This thermometer fits comfortably and securely in your hand while the LCD on the side of the handle remains easy to see and read. The fast-responding, fold-away probe is made of high quality stainless steel and can penetrate semi-frozen and semi-solid foods such as meats, ice cream, and cheeses. The Checktemp®4 automatically turns on when the probe is folded open. When finished with measurements, simply wipe the probe clean and fold it away. Checktemp®4 automatically turns off once the probe is returned to its original position so you can safely carry it in your pocket. CAL Check™ – As you unfold the stainless steel probe, the Checktemp®4 automatically turns on and immediately performs a calibration test. This unique Hanna feature provides the security of knowing you have accurate measurements. CAL Check™ also lets you know if your battery level is low or if your meter requires recalibration. AISI 316 Stainless Steel Probe – The sharp-tipped penetration probe is composed of stainless steel, providing fast and accurate temperature measurements of a wide variety of samples. Enhanced Battery Life – The Checktemp®4 uses AA batteries and offers an exceptional 25,000 hours of continuous use. Auto Shut-off – The battery life of the Checktemp®4 is preserved by this feature which automatically turns the meter off after 8 minutes of non-use. HI151-01 is supplied complete with battery and instruction manual. 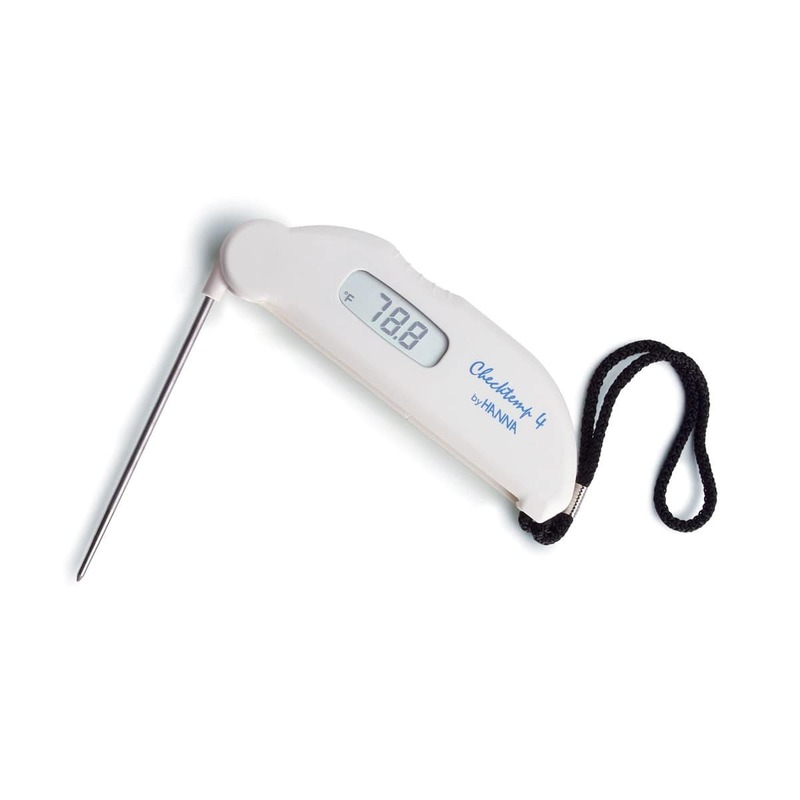 The HI151 Checktemp®4F is a folding digital thermometer with stainless steel penetration probe. It offers an ergonomic design and delivers high accuracy measurements over a wide temperature range.